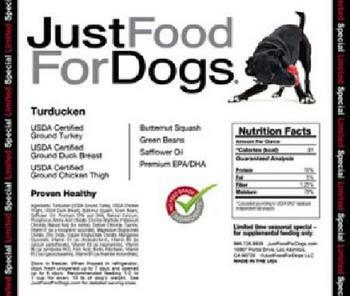 JustFoodForDogs (JFFD) of Los Alamitos, Calif., is recalling its Beef & Russet Potato, Fish & Sweet Potato and Turducken dog food meals. The green beans used in the meals may be contaminated with Listeria monocytogenes. The recalled items, produced from November 1, 2017, through January 14, 2018, contain Best By lot code dates of 11/01/18 through 01/14/19. They were distributed refrigerated or frozen with sizes 7-oz., 14-oz., 18-oz., and 72 oz., only through 11 JFFD retail locations in Southern California, three Pet Food Express (PFE) locations in Southern California and 10 Northern California PFE locations. Customers who purchased the recalled products from a JFFD store may contact JFFD at 866-726-9509, from 9:00 AM – 7:00PM (PST) seven days a week for a full credit or refund. Consumers who purchased the recalled products from Pet Food Express may return them to any Pet Food Express for a full credit or refund.